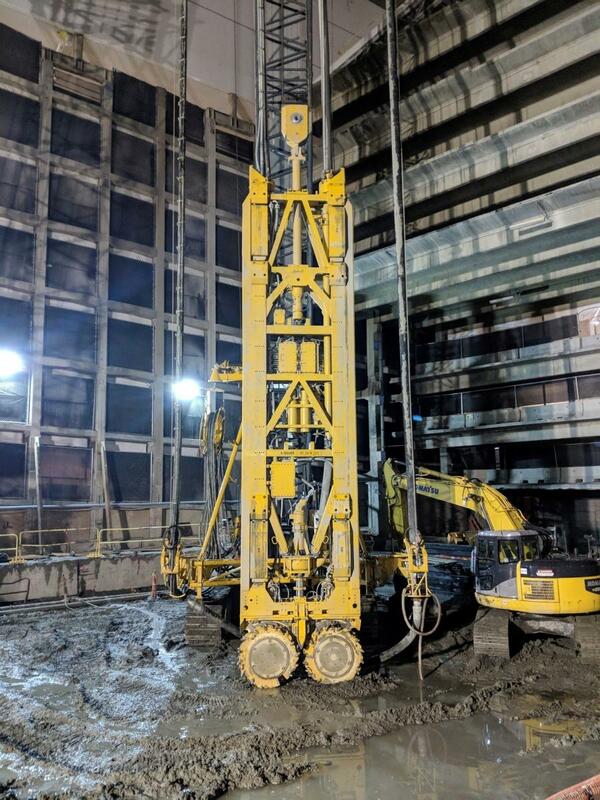 HUB Foundation Company used a BAUER MC 96 duty-cycle crane with a BC 35 trench cutter to install a slurry wall and LBEs at Bullfinch Crossing in Boston. 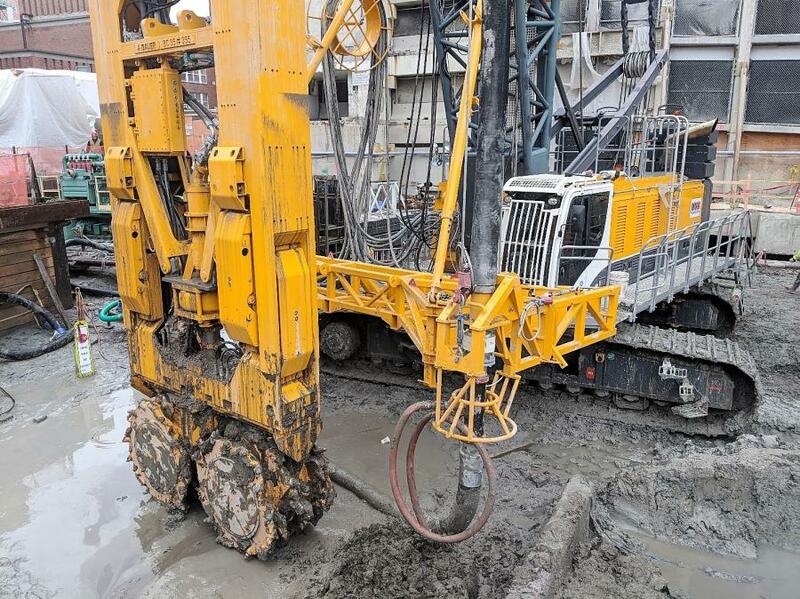 HUB Foundation Company used a BAUER MC 96 duty-cycle crane with a BC 35 trench cutter and a BAUER MAT DE 500-20 slurry handling system to put in the foundations for a residential tower at Bullfinch Crossing in Boston. It represents the contractor's bold entrance into the slurry wall market and the first time Equipment Corporation of America (ECA) has sold this package of machinery in North America. ECA and HUB had an established relationship, but it was March 2017 at Con-Expo/Con/AGG when the conversation started about breaking into Boston's slurry wall market. President and Owner Jim Maxwell knew that specialty equipment would be required and would come at a great cost. HUB had established a reputation as a top-notch drilled shaft contractor. Although the contractor had developed expertise in bentonite slurry over the years, its leadership team had endless debates about whether to enter the slurry wall market. Bullfinch Crossing, a project HUB had under agreement, presented a timely opportunity that would make the decision clear. The geotechnical engineers had changed course. What started as a drilled shaft project would now include a slurry wall with load bearing elements (LBE). There were no gut decisions; the contractor vetted every major brand of slurry handling equipment before making an investment. Traditionally a loyal Soilmec customer, HUB had assembled an armada of its drilling rigs. The contractor ultimately concluded that BAUER was the global leader in slurry handling equipment. Financing an investment of this magnitude was important. BAUER-Pileco's equipment finance specialist Anja Frazier entered the equation early on to make the numbers work. She can often obtain creative financing, which played a key role in this decision. 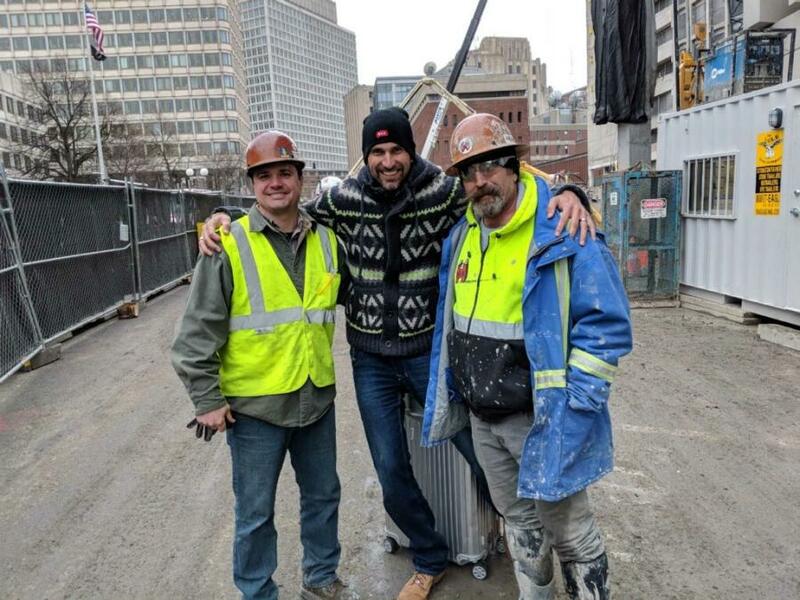 Anthony Sciortino, sales engineer of ECA Boston, and his father David, ultimately closed the deal along with Gordian Ulrich of ECA's Philadelphia office. Ulrich serves as BAUER applications engineering manager. Bullfinch Crossing, which would represent HUB's maiden voyage, was scheduled to begin in August 2017. HUB pushed ECA and BAUER to make sure the equipment would be on site and they delivered. Ironically, the owner delayed the project until December. Nevertheless, the equipment was delivered as promised in July. ECA and BAUER took advantage of the extra time by setting up, conditioning and testing the equipment in HUB's Chelmsford, Mass., yard. HUB had already closed the deal on the BAUER equipment, but traveled overseas to maximize the investment before firing it up. ECA and BAUER funded a trip to Europe so HUB could see the equipment in action and learn from some contractors that were using it. The plan was to visit projects in Paris, France, and Germany, in addition to BAUER's open house in Schrobenhausen, Germany. A chance encounter with Israeli geotechnical contractors Shikun & Binui and Geo Danya of Israel led to a follow-up trip to Tel Aviv where HUB toured multiple projects and received a crash course in slurry wall construction. Ofer Mastbaum of BAUER Maschinen played a key role as well. Situated in a historic district, the tower will give future residents breathtaking panoramic views of one of America's oldest cities. The situation for HUB at the ground level; however, was far from ideal. This collection of massive BAUER machinery may look out of place in some American cities, but not in Boston. 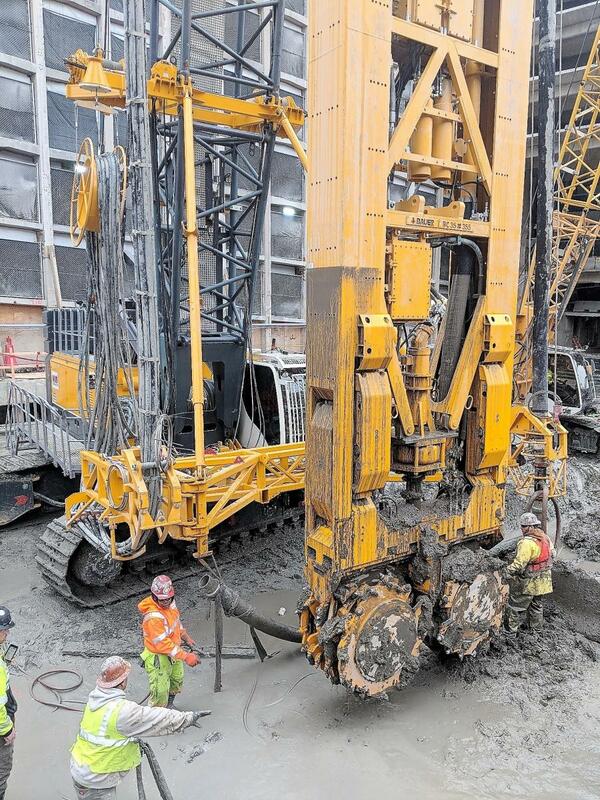 New York and Toronto design their excavation pits for secant pile walls, but Boston's geotechnical engineers prefer slurry walls. 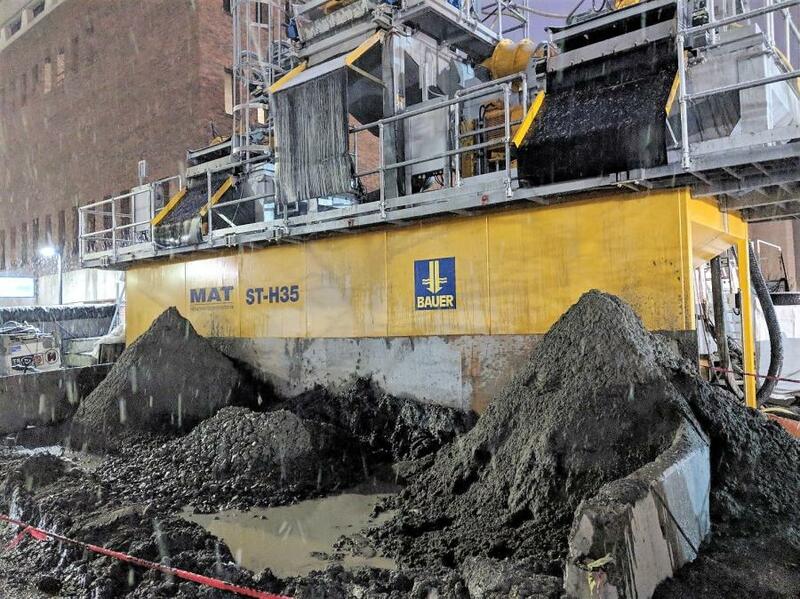 Slurry is effective for holding open excavations in these materials, which is why subsurface conditions in Boston are more conducive to slurry walls than its sandier counterparts like Connecticut or Rhode Island. The city's complicated subsurface conditions play a role. Boston was originally an 800-acre peninsula (Shawmut). Today a large portion sits on man-made land due to a series of projects starting in 1630. The soil is a Boston Blue Clay underlain by Glacial Till and Cambridge Argillite. The Cambridge Formation underlies most of the downtown area. HUB used the BAUER MC 96 with BC 35 to dig out a rectangular trench for the slurry wall. It also installed LBEs to support the load of the tower. There were 22 70- to 84-ft. panels, eight of which interlocked to form the core wall. Each was 3-ft.-wide and 9.2- to 22.7-ft. long. The job also included 107 85- to 130-ft. minipiles and three 85-ft.-long, 4-ft.-diameter drilled shafts, and 42 piles for support of excavation (SOE). The excavation was more shallow than anticipated, and due to the Boston Blue Clay, HUB started the excavation using another crane with a grab. The BC 35 was used to clean out the holes and finish the rock sockets, which ranged in length from 17 to 33 ft.
HUB found that the clay was stiff, the Argillite had minimal fractures, the Glacial Till had cohesive properties, and there were no large areas of sand or gravel in danger of collapsing. The rectangular Bullfinch Crossing site is wedged between the towering walls of the existing government center garage and two busy streets. 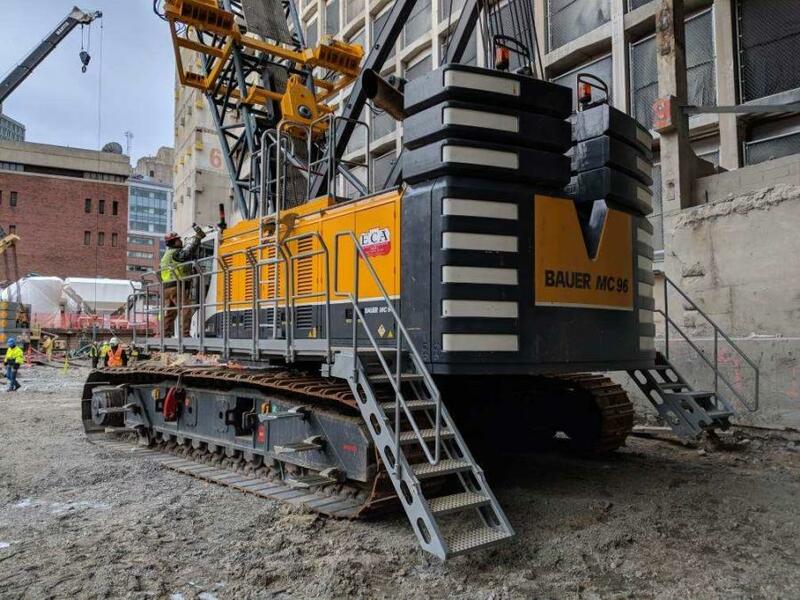 The BAUER MC 96 was one of four cranes on site, in addition to a host of drilling and excavating equipment. HUB was restricted from accessing the core wall until late in the project, which hampered its efficiency and sequencing by confining crews to a small portion of the site. HUB chopped away at the slurry wall and LBEs one section at a time and shuttled machinery between working areas and parking spots. HUB's Bullfinch Crossing project was initially designed to include a combination of drilled shafts and micropiles, but geotechnical engineers Haley and Aldrich added LBEs to the mix. The challenges of supporting a 45-story building on a small footprint became clear during the core design, according to Maxwell. He explained that these dimensions created tremendous shear load and uplift. The loads on a tower with a larger footprint would have been axial, transferring downward through the foundation. The centerpiece of the operation was a BAUER MC 96 duty-cycle crane. Its HTS (hose tensioning system) 58M enabled a cutting depth of up to 190.3 ft. The BC 35 — a 41.3-ft.-high-by-9.2-ft.-long unit with four cutter wheels — carved out the 36-in.-wide trench for the slurry wall. The slurry handling system was a BAUER MAT DE 500, which consists of two BE 250-60 desilters and an ST H35 agitation tank. It was used to remove soil particles from the Bentonite slurry used during installation of the LBEs. Mobilizing the equipment and keeping it running properly was critical. The project delay exacerbated matters. ECA facilitated a connection up front that resulted in HUB hiring industry expert Sal Arslan full-time to keep Bullfinch Crossing running smooth. He helped to set up the slurry handling system, mobilize the crane and cutter, train HUB's operator, and share his knowledge of slurry wall construction. HUB acquired the BAUER crane, cutter, and slurry handling system as a package, although it could have mixed and matched other brands. By doing so, the contractor was able to use the B-Tronic System, which collects data from dozens of sensors located at all critical points in the cutter. The display of the cutter's current position and the deviations in both x and y direction enable the machine operator to adjust the steering plates and maximize performance. HUB pumped Bentonite from a hose within the cutter to support excavation for the slurry wall. The slurry spoils were then pumped into the BAUER desanding plant to remove soil particles. The clean slurry was pumped back into the trench for temporary excavation support. Project delays put HUB on site during the winter months. Keeping the plant warm and slurry from freezing was a factor during repeated bouts of snowfall, sleet, and freezing rain. Dealing with the slurry left over from the cutting operation was difficult on the compact site. The loadout area for the spoils and the rebar laydown area were one in the same. “We trucked in as many cages as we could. We were able to build the cages for the LBEs off site, truck them in as needed, and put them in the hole right away,” explained Maxwell, noting that this kept the slurry loadout area open. That strategy ended when it was time to build the core wall. They were too big to haul so HUB's crews had to assemble them on site. This resulted in periods of up to four days where slurry spoils were piling up, consuming nearly one-third of the site. Further complicating matters, the landfill only accepted two loads per day and wouldn't take material during inclement weather. Bullfinch Crossing was a successful maiden voyage for HUB. There were no equipment breakdowns and no major surprises underground. More importantly, HUB now has a successful slurry wall project under its belt. The company plans to concentrate on the New England and Upstate New York market it serves for now. Whether HUB's venture into the slurry wall market pans out remains to be seen.